Activities: Presentations about the Western Bluebird, Prescott Bluebird Recovery Project, Monitoring Bluebird Nestboxes, and volunteer opportunities. This is an opportunity for potential new monitors to informally interact with active current volunteers to exchange information and their experiences. Day Use parking fees will be paid by PBRP. Just park and come into the Visitor Center! Sign Up to join our bluebird nestbox monitoring team in 2019! Please send email to email@prescottbluebird.com with the subject “RSVP Spring Workshop 2019” and your contact information in the message. 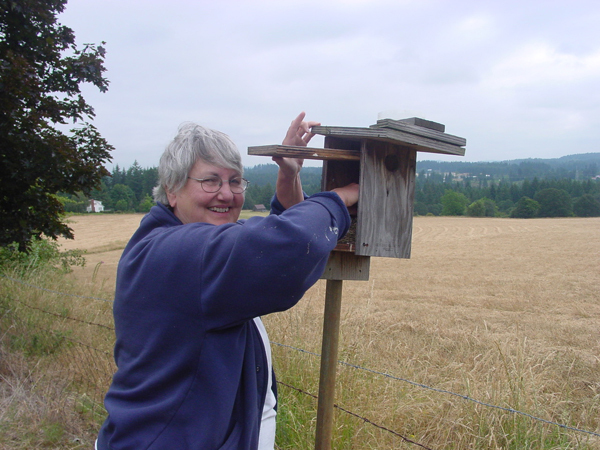 Bluebird monitoring is ﬁeld work observing existing nest box routes in the low and mid-elevation countryside in such locations as Sherwood, Newberg, Dundee, Bald Peak, Scholls, Laurel, Farmington, Wilsonville, Oregon City, Carus, Beavercreek, Canby, Estacada and other areas in the greater Portland Metro area. Bluebirds do not commonly nest in our cities and towns due to competition from non-native species and the availability of the foods they need to successfully raise their young. We especially encourage volunteers from communities near the bluebird routes. The route monitor time commitment is from early April through mid-August on an assigned nestbox route, visiting every 6-8 days. The average number of sites monitored on most route is 15-20. Taking accurate, timely ﬁeld notes and translating them into a weekly report sent to your bander/team leader is a critical part of the process. 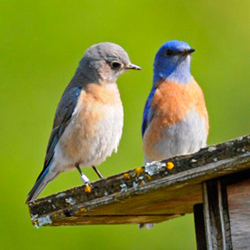 Formal end of season reports of bluebird nesting activity and a summary of other bird species nesting in the bluebird nestboxes are required at the end of the season. At the workshop meet volunteer bluebird banders/team leaders, who provide ﬁeld training, mentoring, and ﬁeld resources for monitors. Meet and talk with current monitor volunteers. We Look forward to seeing you at our 2019 workshop! Activities: For Current Volunteers Only. Review of 2018 nesting season, project board member and treasurer’s report, projections for 2019, and other organizational discussions. Volunteer sharing opportunities and announcement of additional volunteer service opportunities within the project and outreach/education. It’s FUN to monitor Bluebirds!